Unfortunately for my recent cravings, I couldn’t bring myself to actually buy a loaf of cheap white bread, as if the Junk Food Police would come by later that night. But I really wanted a cheese sandwich, so I circumvented my inhibitions by baking myself a loaf of suitable bread. It’s not bad for you if you made it from scratch, right? 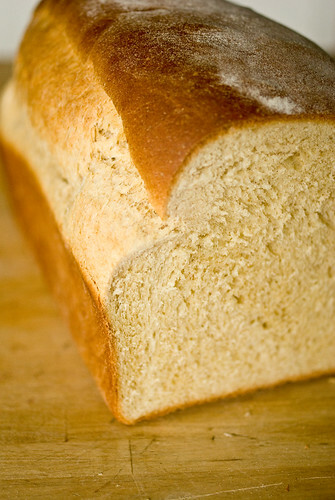 One loaf, mostly white bread flour with just a little whole wheat, sweetened with honey and enriched with milk and egg. I baked it the evening before and let the loaf rest. It sliced easily, and the crust was tender and perfect. It toasted nicely in the pan without needing a vast amount of butter, and held onto the melted cheddar in just the right gooey way. It was a perfect cheese sandwich, with nothing but bread, medium cheddar, and butter. 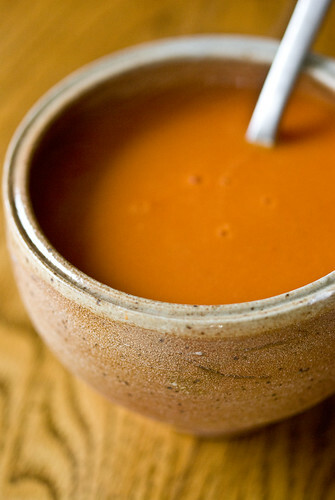 I didn’t have tomato for it, so I heated up some Pacific boxed tomato-red pepper soup to dunk into. It made me happy. 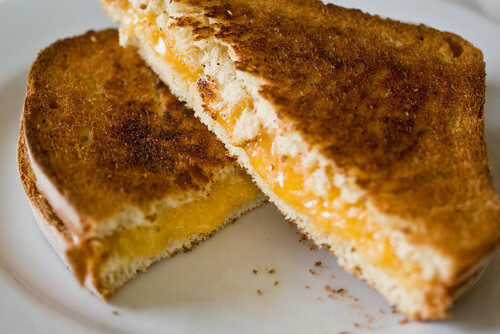 What’s your ideal grilled cheese sandwich? 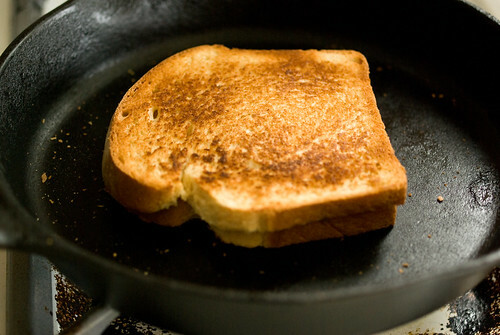 Breadfarm allium bread makes the best grilled cheese ever! Oh my god, I absolutely have to try that. What kind of cheese did you use, Katharine? Gruyere is my favorite but a good old cheddar certainly isn’t a bad second choice. Breadfarm just started making allium bread again this week. I see a trip to Edison in your future. Sounds like a good twist on a classic favorite. I will have to give it a try with that type of bread and soup.